Chomsky wrote “After Pinkville” ― areas like Song My were then colored pink on American military maps ― in 1969. Almost half a century later, the question is: Have things improved? After all, in Ken Burns’s new Vietnam extravaganza, his 18-hour documentary on that war, he seems to have captured the zeitgeist of the moment by carefully changing the word “murder” in the script for the My Lai episode to “killing.” “At lunch, Burns defended his change,” wrote the New Yorker’s Ian Parker,“on the ground that My Lai continues to have ‘a toxic, radioactive effect’ on opinion. 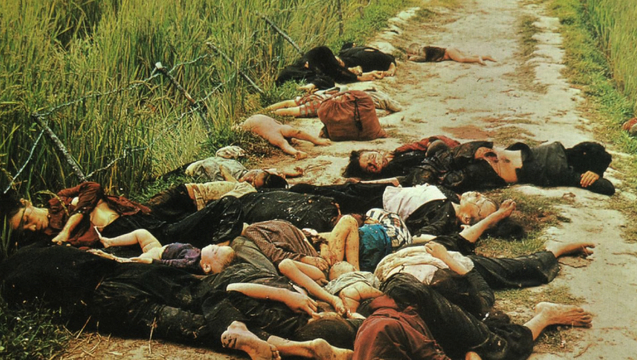 ‘Killing’ was the better word, he said, ’even though My Lai is murder.’” To be thoroughly upbeat, perhaps by 2067 Americans will finally be able to take “murder” straight on television when it comes to My Lai. Almost 50 years ago, Daniel Ellsberg was both celebrated by many and unsuccessfully prosecuted by the Nixon administration, in part under the Espionage Act, for releasing The Pentagon Papers, a massive secret trove of documents that revealed to the American people something of what the United States was actually doing in Vietnam. In our era, Chelsea Manning did something similar. She turned over a twenty-first-century trove of secret documents on the Afghan and Iraq wars ― on, that is, what she’s accurately termed “death, destruction, and mayhem” ― to WikiLeaks and for that she was celebrated by few and prosecuted and convicted by the U.S. military. Pardoned by President Obama after seven years in military prison, she recently had her visiting fellowship to Harvard’s Institute of Politics at the Kennedy School of Government rescinded after CIA Director Mike Pompeo cancelled a talk there, complaining that Manning had “betrayed her country,” and former CIA Acting Director Michael Morell, a senior fellow at the same school, resigned in protest. Or to put it another way, Harvard caved to men who represented an agency that had committed secret acts of horror betraying every imaginable American value. (To give credit where it’s due, significant numbers of Harvard faculty members protested this craven act.) The same institute felt no compunctions about offering a visiting fellowship to former Trump press secretary Sean Spicer and, despite alumni protest, not rescinding it. Perhaps there’s an essay, “After Punkville,” to be written about all of this. Under the circumstances, it’s our good fortune that, with civilians regularly being “killed” by U.S. firepower across the Greater Middle East, Noam Chomsky continues to remind us what our world really looks like if we don’t censor either our language or our thoughts. It makes today’s TomDispatch post, “The Trump Presidency,” a recent interview from his upcoming book with David Barsamian, Global Discontents: Conversations on the Rising Threats to Democracy, particularly relevant to our moment.